Drop Crotch-ing actually. Remember my post on G-Star Raw's tapered denims? I'm digging it. Are you liking it? Would you wear denims like these? I like drop crotch pants but one has to have the "attitude"... like the siga ng kalye attitude to pull it off, otherwise its "jologs". LOL. Hahaha! Love the siga kalye reference! I really like the shape of these pants. I purchased a pair from Zara with the same silhouette. 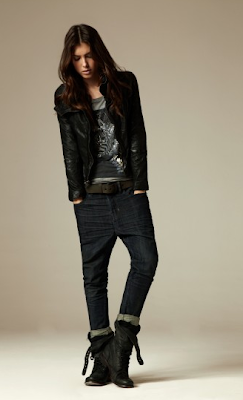 I like the wash of the AllSaints pair though! Oh I love those Harlem Denim Jeans. I would wear them, yes! visit my blog and follow me and I'll return the favor!